Through the evolution of keeping a reef tank, one thing that stays consistent is the need to perform water changes. Water changes remove waste and replenish the necessary elements your tanks inhabitants need to grow and thrive. Many of us start by purchasing saltwater from a local fish store for water changes, which does have its benefits—but also leaves some mystery in terms of the quality of water and what is actually going into your tank. If the store’s filter system is not regularly maintained, there may be nitrates, phosphate or other impurities in the water. Some salt mixes work better for fish-only aquariums while others with higher levels of calcium, alkalinity and major/minor elements are better for reef aquariums. If a store changes salt mixes, it may also have unexpected effects in your aquarium. 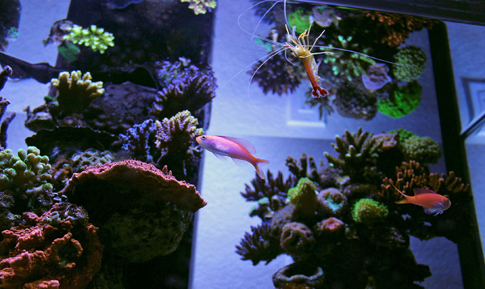 Mixing your own saltwater at home is in fact a much better way to obtain saltwater because it allows you to choose the salt best suited for your aquarium and allows you to control many of the variables. 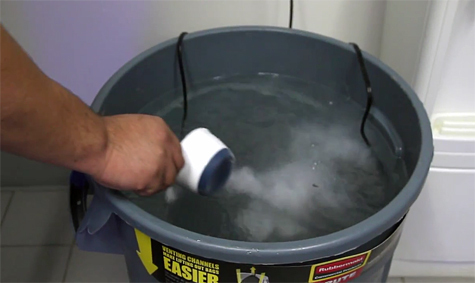 Thankfully mixing saltwater is fairly easy but must be done correctly and of course you will first need all of the necessary equipment. You will need a large container that can hold 10% or more of your tanks water volume. Here at Marine Depot, we use the food-grade Brute trash cans with caster wheels which make it easy to move the water. Aquariums and various other plastic containers also work very well. Just be sure to get something that is food grade or suitable for potable water storage because Lower grade plastic containers may leach phosphates and other unwanted chemicals into the water. To measure the salinity we recommend the use of a refractometer for accuracy. Hydrometers can also be used but should be calibrated regularly as they can become inaccurate over time. 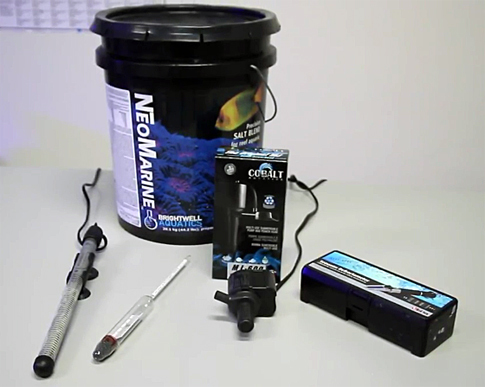 A powerhead is needed to mix the water as well as an aquarium heater to match the water temperature of your aquarium along with a thermometer to measure the temperature. First, fill the mixing container with fresh RO/DI water. You will want to mix enough water to complete the desired water change and I always mix a few gallons extra just in case the unexpected should occur. Next, drop in the powerhead to start aerating the RO/DI water. This helps to remove excess CO2 and ensures a proper pH. You can also add the heater in order to get the water up to temperature. Now look at the instructions for your salt mix and calculate the amount of salt needed to match the salinity in your aquarium. Each salt mix is different so be sure to read the manufacturer instructions carefully but basically the concept is the same, add enough salt to reach the desired salinity level. 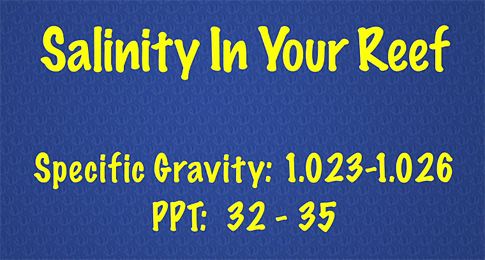 This should be maintained at 1.023-1.026 specific gravity for a reef tank. We are using the Brightwell Aquatics NeoMarine salt mix which calls for ½ cup per gallon of freshwater for a salinity of 1.025 specific gravity. Since I have 20 gallons of water to mix, I will need 10 total cups of salt mix. One important note here, if you are storing your salt mix be sure to seal it well. Salt mix will draw moisture from the air and turn into a solid rock if left unsealed for any extended period of time. Add the salt mix slowly into the RO/DI water inside your mixing container. It is normal for the water to cloud when you add the salt mix but it will clear up. After a few hours of mixing, measure the salinity using your refractometer or hydrometer and adjust the salinity as needed. Once the desired salinity level is reached you should let the water continue to mix and aerate for the amount of time recommended by the manufacturer. Some salt mixes are best used within 3-4 hours of mixing while others should mix for 12-24 hours before use. Mixing saltwater at home saves you the hassle of lugging around cumbersome containers of water to and from your local fish store. It will also ensure that all the water entering your aquarium has consistent parameters and is free of unwanted contaminates. 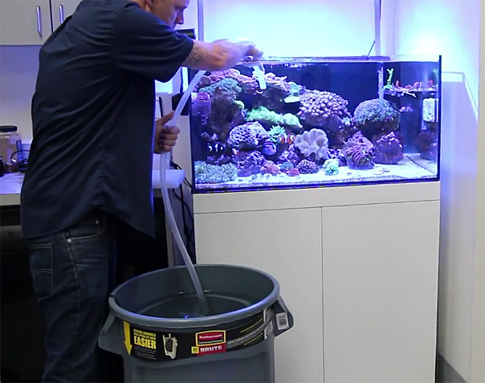 If you are looking to start mixing saltwater at home or simply have some questions, contact our trained team of aquarium experts today for fast and friendly support. If you found this article and the accompanying video helpful, please like, share and subscribe to help us bring you more informative content just like this.